Sharlene McLin, age 66. Sunrise June 6, 1949 in Tanner, AL and Sunset August 6, 2015 at Zusman Community Hospice in Columbus, OH. Sharlene was a Production Assurance Specialist at J.P. Morgan Chase. She was a member of Praise Temple Church where she sang in the choir, was a Sunday school teacher, former trustee and church secretary. Sharlene was preceded in death by her parents Council and Ollie Louise McLin, brothers Tommy and Leo and sister Barbara. Left to cherish her memeory, son Ronald M. McLin, daughter Monique T. (Anthony) Murphy, brother Howard McLin, sisters Glenda McLin, Tracy McLin, Margie McLin, Mattie McLin, Kathy (Roosevelt) Jefferson, Sharon Clift, and Terry Reedus, grandchildren Isaiah, Aaron, Anthony II, Morgan and Amaya and a host of other family and friends. Graveside Service will take place 10:00am Wednesday August 12, 2015 at Eastlawn Cemetery, The family will then receive friends at Praise Temple 2618 Bethesda Ave. 11:00am Wake and 12:00 noon Memorial Service. Ministry of Comfort entrusted to MARLAN J. GARY FUNERAL HOME, THE CHAPEL OF PEACE 2500 Cleveland Ave.
Cookie , I’ll always remember you .Your family was my family. Our thoughts and prayers are with your family. To all your sisters and family here in Alabama we pray that God’s grace and peace will be with them today and the days to come. Annie Odell Sales and Maggie Harris. SENDING MY HEARTFELT SYMPATHY AND CONDOLENCES TO THE FAMILY DURING THIS DIFFICULT TIME. I am so sorry for your loss. I worked with Sharlene at Bank One and Chase. She was a wonderful person. I’m so sorry to hear of Sharlene passing. I worked with her at Bank One and Chase. She was always so positive in what she was doing. A great person to work with. Sharlene was one of the very 1st people I met when I started at ‘City Nat’l Bank’ .. it was called back then … in 78 … wow… that looks ancient. We became best buds quick & always had a laugh together … truly a very special genuine lady ! She knows I loved her … we all did…. and I’m pretty sure she knew that. It seemed just a few years ago when we started working together for the bank in 1970. You were a joy to work with and you will be missed. It saddened me deeply to hear of Sharlene’s passing. She and I worked together at Bank One, IBM and Chase. She was a wonderful co worker and more than that she was my friend. We had many lunches together and used to take our afternoon walks around the building. 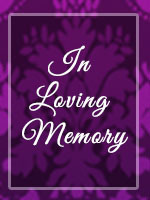 She dearly loved her family and friends and will be terribly missed by all. bring comfort to your tears and heart.